File Name: David J. Bennett of Burford, England. Notes: Burford is a small town about 20 miles west of Oxford. Filecards from 2002 onward spell the last name Bennet. 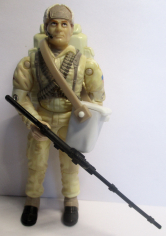 Notes: DiC's Big Ben wore his 1991 outfit with a bluish tint to his jacket and no face camo. Accessories: black M240 machine gun with handle on top (new), and wide bipod with crossbar (new), two black smooth, spherical grenades (new), tall dark green backpack with three engraved grenades and shovel (new), dark green grenade pouch with opening lid and soft plastic strap (new). "To qualify for the SAS, a candidate trooper must complete the 'Long Drag' which is a forced march over 30 miles through marshes and rough, hilly terrain, carrying 50 pounds of equipment. This march must be completed in less than 20 hours and is a grueling test of endurance and land navigation. Big Ben completed his march in 12 hours, had a bit of supper, and volunteered to go back out and help search for candidates who got lost in the moors..."
Accessories: black machine gun (87 Tunnel Rat's), black figure stand (common). There comes a time when the power of evil becomes so threatening to world peace that global leaders must join together to stop its impending danger; Cobra is just such an evil. An international force of G.I. Joe combat specialists have been called upon to hit Cobra and hit them hard! Russia is represented by BIG BEAR, an anti-armor specialist who loves to blow up Cobra tanks. From England comes BIG BEN, an expert in subversive operations and enemy infiltration. Japan has sent BUDO, one of its greatest samurai warriors who plans on slicing Cobra into tiny pieces of snake meat. SPIRIT, a Native American also joins the team from his home in Arizona, where he was called for duty to track down and eliminate Cobra Dreadnoks. World peace must be upheld and Cobra evil must be stopped...TODAY! Toy Notes: Exclusive to the mail offer Menace in the Wilderness, along with Budo, Big Bear, and Spirit. Accessories: black machine gun (91 Big Ben's), two black grenades (91 Big Ben's), white backpack (91 Big Ben's), white grenade pouch with cream strap (91 Big Ben's). "To qualify for the SAS, a candidate trooper must complete the 'Long Drag' which is a forced march over 30 miles through marshes and rough, hilly terrain, carrying 50 pounds of equipment. This march must be completed in less than 20 hours and is a grueling test of endurance and land navigation. Big Ben completed his march in 12 hours, had a bit of supper, and volunteered to go back out and help search for candidates who got lost in the moors!" Toy Notes: Carded in a two-pack with Whiteout. Item #57755. Accessories: black rifle (83 Snow Job's), black machine gun (91 Big Ben's), two black grenades (91 Big Ben's), green grenade pouch (91 Big Ben's), black figure stand (common). The British Special Air Service (SAS) is roughly the equivalent of the American Special Forces. It maintains an equally tough standard for its recruits. SAS soldiers work in small units as a tightly-knit team. They go behind enemy lines by land, sea, or air for covert missions. Part of the Mobility Troop, BIG BEN has participated in many missions, the details of which remain classified. He's now on assignment with the G.I. Joe forces to lend his commando skills to the team. BIG BEN thinks the Americans have strange accents and even stranger ways of doing things, but he admires their iron-fisted courage. When he fought the COBRA ALLEY VIPERS in a covert operation, he showed them why it's never wise to be on the wrong side of an SAS solider. "I'm here to teach the bad guys that the fight for freedom and justice knows no borders." Toy Notes: Carded in a two-pack with Cobra Alley Viper. Item #57480. Accessories: graphite rifle (83 Snow Job's), graphite machine gun (91 Big Ben's), two graphite grenades (91 Big Ben's), graphite grenade pouch (91 Big Ben's), graphite figure stand (common). Toy Notes: Carded in a two-pack with Cobra Alley Viper. Item #57445. The British Special Air Service (SAS) is roughly the equivalent of the American Special Forces. It maintains an equally tough standard for its recruits. SAS soldiers work in small units as a tightly-knit team. They go behind enemy lines by land, sea, or air for covert missions. Part of the Mobility Troop, BIG BEN has participated in many missions, the details of which remain classified. He's now on assignment with the G.I. JOE forces to lend his commando skills to the team. BIG BEN thinks the Americans have strange accents and even stranger ways of doing things, but he admires their iron-fisted courage. 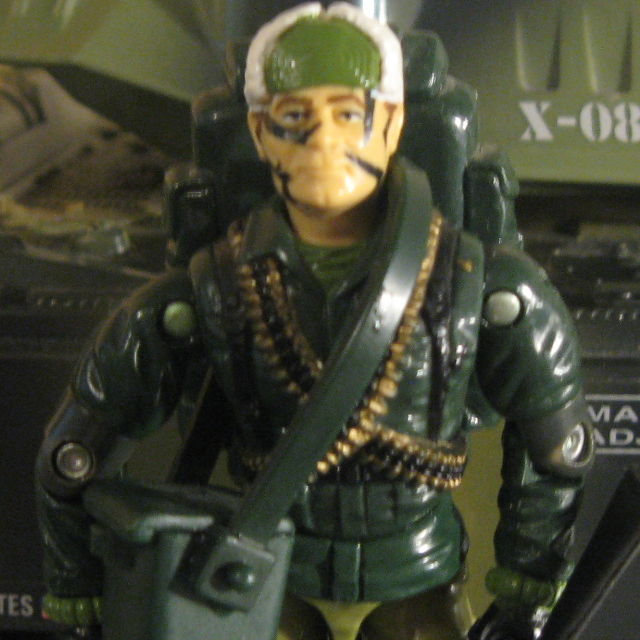 When he fought the COBRA ALLEY VIPERS in Operation Streetwise, he showed them why it's never wise to be on the wrong side of an SAS solder.